I chose this recipe as it requires only a handful of ingredients, and it has an interesting way to cook the chicken - you have to parboil the chicken before frying. 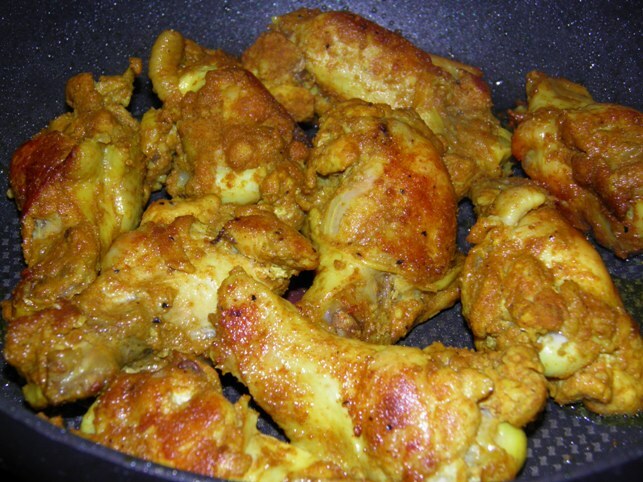 This article explained that parboiling chicken before frying will help to reduce the amount of oil used for frying and to cook the chicken faster. The original recipe still used 1 cup of ghee to fry the chicken, so I am not sure the author chose to parboil the chicken to use less oil for frying...But anyways, I have modified the recipe quite a bit by reducing the amount of chilli powder and oil used. The little drumsticks were finger-licking and super garlicky! I think they will be great for barbecue too. So next time I will just parboil the chicken and then pop them onto the barbecue for about 5 to 10 minutes. 1. Marinate the chicken with the first 5 ingredients, then set aside in the refrigerator for at least 2 hours. 2. Pour 1 cup of water into a large heavy-based pan and add 1 tsp of salt. Add the marinated chicken and bring to the boil, then reduce the heat and simmer for 15 to 20 minutes, or until the water has evaporated and the chicken is cooked through. Remove the drumsticks from the water and place them on a kitchen tissue to dry a bit. 3. Heat the oil in another pan over low heat, add the chicken and fry for 10 minutes, or until golden brown.